3D Printing technology could revolutionize and re-shape the world. Advances in 3D printing technology can significantly change and improve the way we manufacture products and produce goods worldwide. If the last industrial revolution brought us mass production and the advent of economies of scale - the digital 3D printing revolution could bring mass manufacturing back a full circle - to an era of mass personalization, and a return to individual craftsmanship. 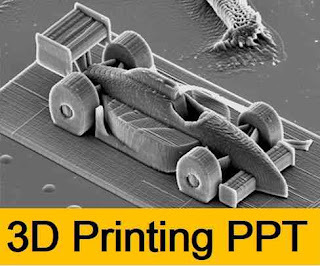 We have uploaded the 3D Printing PPT Report with illustrated images.If you want to download the 3D Printing PPT Report then simply click the link given below. There is also given the preview and link of 3D Printing PPT Report uploaded in Slideshare. All the images used are copyright to the owners of the respective websites mentioned in the 3D Printing PPT Report on reference slide.